It is summer. Time to fire up the grill and create some great memories. One of my favorite things to grill in the summer is ribs. Typically when we grill anything my husband does the cooking but when it comes to ribs, I am the one in charge. I heard about this amazing contest from Tyson Fresh Meats, Inc., McCormick & Company, Inc., Kraft Foods, Inc., and the National Pork Board. 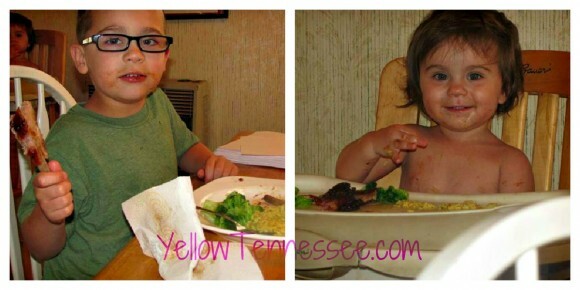 Two grand prize winners will win a years worth of groceries as well as a trip to Memphis in May. What a great contest! I received an amazing grill kit so that I could come up with my own rib recipe. So then my creative juices really got flowing. Apple and Cherry Smoked Ribs with Apple Honey BBQ sauce. McCormick Grill Mates Sweet and Smokey Rub. In the grill kit I had a wood chip set with 6 flavors of wood from Weber. I used the cherry wood for this recipe but you could easily do it without or with any other wood chips. First you are going to salt and pepper the ribs on both sides. Then rub them down with the McCormick Sweet and Smokey Rub. Don’t be stingy. 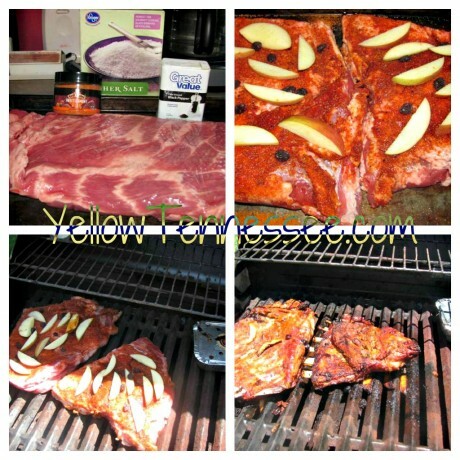 Cut up one and a half apples and lay the slices of the apples and the dried cherries on the ribs. Then place them on the grill. I always cook over indirect heat. Leave the burners on one side set to low and turn the burners under the meat off. Cook this way for about 3 hours turning the meat every 45 minutes. You may need to cook your ribs a little longer depending on size. While the ribs are cooking take one bottle of Kraft Honey BBQ Sauce and empty into a sauce pan. Take the other half of the apple and dice it up then add to the sauce. Cook over very low heat until the apples cook down. You will have to stir often as the sauce can burn easily. Then set aside to cool until your ribs are done. Once your ribs are finished cooking apply a lot of the sauce to both sides. We like a lot of sauce so I really pour it on them. After you have sauced the ribs, they are not ready to eat just yet. This next step is a bit odd but I promise you that it will make the most tender, fall off the bone, ribs you have ever had. Wrap the ribs very tightly in foil and then place them in a cooler for at least 2 hours. 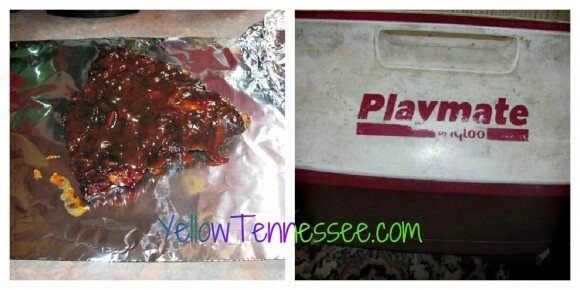 The cooler and foil hold in the heat from the ribs and they will continue to cook while they sit. This very low temp over a longer period of time will make your ribs so tender you can eat them with a fork. As you can see everyone loved them. In fact Genghis ate more than I did and even requested the leftovers for lunch the next day. Don’t forget to head over to Dibs On My Ribs and enter or vote on your favorite rib recipe. And now for the exciting part. 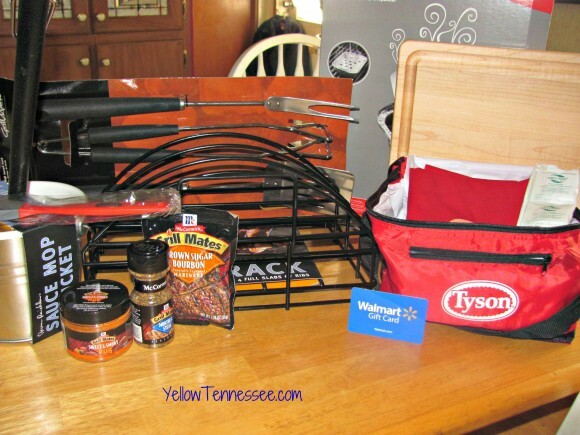 10 lucky readers will each win one $20 Walmart Gift Card so you can buy your own Tyson ribs, Kraft BBQ Sauce, and McCormick Spices so you can make your own outstanding ribs.